Good product at a competitive price with good time delivery.. easy order process for online purchase. yes ... I recommend Bulk Ammo to my friends. Fastest shipping on ammo. Ammo arrived undamaged, opted for inconspuous box (extra protection and doesn't draw attention). Also opted for insurance. I broke in a new Glock 23 and had 2 fte out of 1000 rounds shot. Ammo was accurate and was cleaner than federal 180gr fmj. Bulk ammo ships really fast! Ordered late friday, delivered to my door wednesday morning. 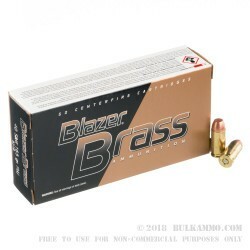 Blazer brass 165 on sale with shipping comes out to $15 a box. Local gun ranges and sporting stores sell these for around $20. Ive had 2 failure to eject out of 500 rounds in a brand new glock and probable limp wristing. Fired 250 rounds through a Gen4 Glock 23 and was very pleased. Q: Whats the balistcs on these? A: Hello! According to CCI, the velocity of this 165 grain Blazer Brass round is 1050 fps with a muzzle energy of 404 ft. lbs. Q: Are these iron core bullets? The Range master does not allow those kinds of bullets. 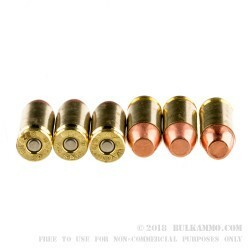 A: Hello George, Blazer Brass ammunition is loaded with a lead core, copper plated bullet. Q: is this reloaded or remanufactured ammo? A: These 40 S&W caliber rounds are factory original loads. All components are new and have not been reloaded or remanufactured in any way. The brass may be saved for the reloading process if desired. CCI Blazer's components are non corrosive as well. A: Hello Mike, These 165gr. 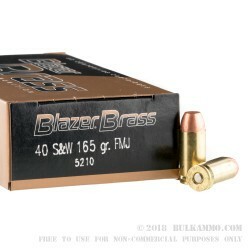 FMJ rounds by Blazer Brass in .40 S&W are new production rounds and not reloads. 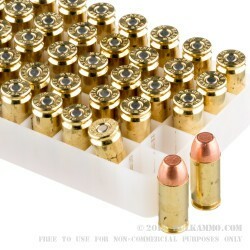 Q: Are these "Blazer" brass cases reloadable? A: Yes, this Blazer brass can be reloaded.